It's hard to believe that the end of June is here and I have managed to get my June Tim Tag done. This month's tag features the Tissue Wrap Collage and Stencil Plaid Techniques. For June's tag I had a ton of fun playing with lots of new products that Tim released at CHA this year. 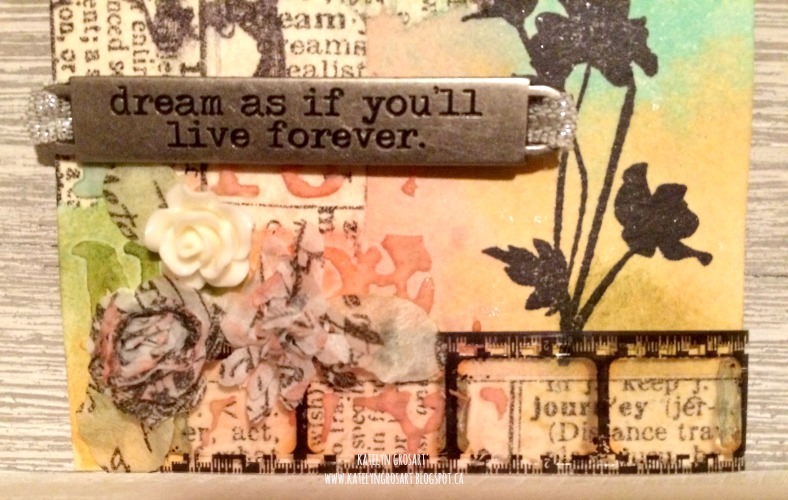 The top favourites from this tag is the Distress Collage Medium in Vintage and the Substrate Sheets. I didn't have the die that Tim used on his tag, so I substituted it for the new Gearhead thinlit die. To finish the gears, I added some of the nail heads to the centres of the gears. 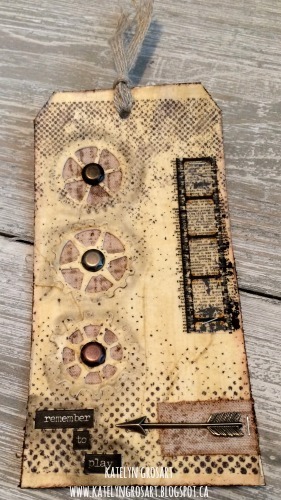 To highlight the gears, I lightly went around with a Black Soot Distress marker and then rubbed it into the tag. For the bottom of the tag, I added a saying using the small talk as well as adding the arrow over top of an extra piece of linen fabric I covered with a stencil & ink. The last piece on my tag was adding a remnant rub and stapling some film ribbon to the right side of the tag to finish it off. I hope I have inspired you to start playing along with the 12 tags of 2016. I'm back on the Southern Ridge Trading blog today to share with you some inspiration for our current monthly challenge which is "Anything Masculine". There is still 7 days to participate and you can find all of the details here on how to enter. 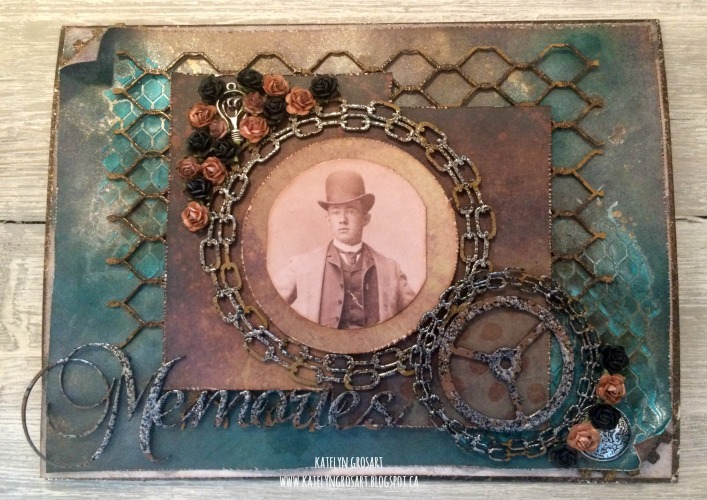 Head over here to read all about how I created this masculine memories board. It's time for a new two week challenge on the Emerald Creek Dares Blog and it's all about "Anything But Paper". This challenge was extremely hard for me, as many projects I thought of had at least one aspect of paper on them. 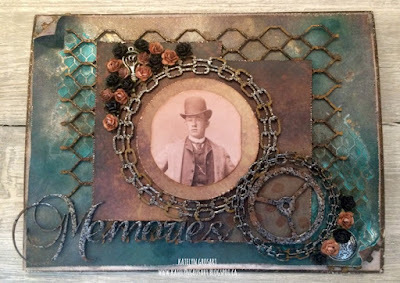 Once I figured out some of the elements I wanted to use on this project, primarily brads and embossing powder, I was off to the races. 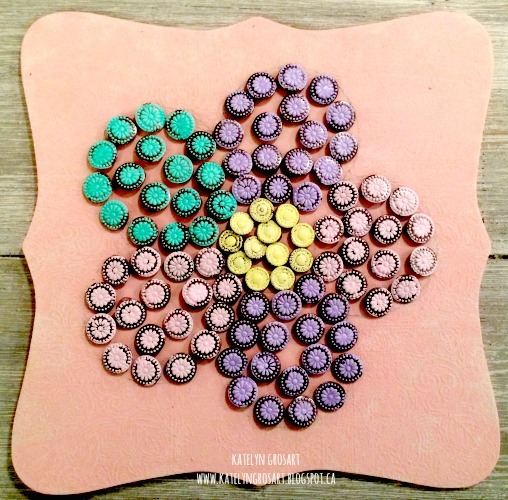 For my project I created a fun flower wall decor piece perfect for any little girls room. Lets get started and I will share with you how you can create my piece at home. To start, you'll need to have your favourite wood shape in front of you, this will be used as your base. Once your background wood piece is in front of you, trace a flower with pencil into the middle of the wood piece. After the flower has been traced, cover around the traced flower with Spun Sugar Distress Paint. You will need to apply two layers. Set aside to dry. After the paint around the flower has dried, using the Flower Collage stamp, apply Versamark to it and stamp onto the top left hand corner of your wood piece. Continue applying VersaMark and stamping on the wood piece and making sure to go around the traces flower until the wood piece is completely covered. In some places the flower collage image will end up in the traced flower and that's ok. Once the entire wood background has been stamped, cover the entire surface with Ultra Puff White Embossing Powder. Tap off excess and emboss with a heat tool. After the it's been embossed, cover the entire embossed floral images with two layers of Spun Sugar Distress Paint. 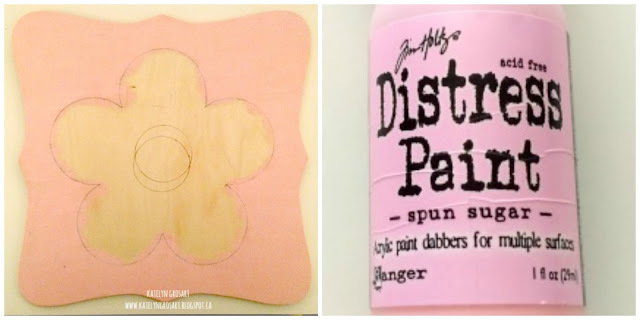 Make sure to go into the traced flower with the Spun Sugar Distress Paint. Set aside to dry. You'll need a whole package of Antique Silver Metal Circle Dot Brads. 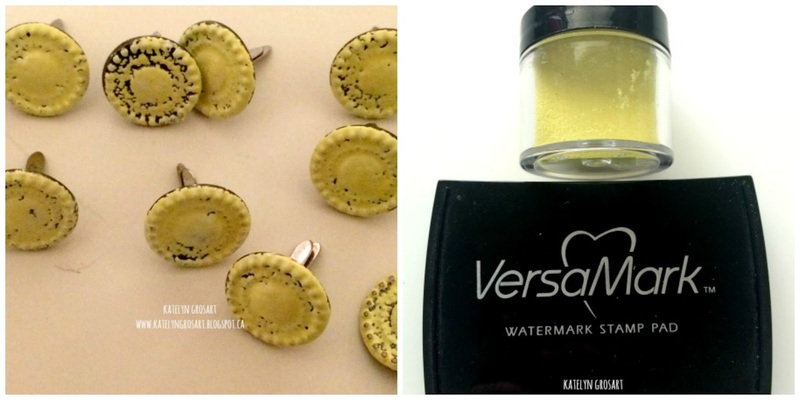 Once you have the brads out of the packaging, dump a little bit of Pastel Yellow Embossing Powder onto a piece of paper towel. One by one, put the top of the brad in the VersaMark and then set into the pastel yellow embossing powder, once the brad is covered, tap off excess and set aside. Continue this step for all twelve. After all twelve have been covered in embossing powder, one by one, heat emboss with your heat tool. To keep your fingers from burning, make sure to hold them with tweezers. Once the brads have cooled, take a pair of wire cutters and cut off the back part of the brad. After the backs of the brads have been removed, set aside in a pile of the same colour. You'll need to count out thirty one Flower Daisy Dots Brads. 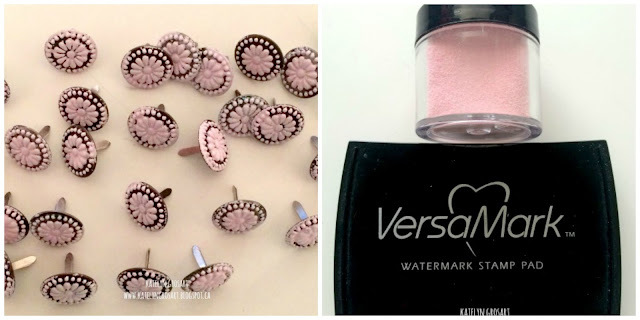 Once you have the brads set aside, dump a little bit of Pastel Pink Embossing Powder onto a piece of paper towel. One by one, put the top of the brad in the VersaMark and then set into the pastel pink embossing powder, once the brad is covered, tap off excess and set aside. Continue this step for all thirty one. After all thirty one have been covered in embossing powder, one by one, heat emboss with your heat tool. To keep your fingers from burning, make sure to hold them with tweezers. Once the brads have cooled, take a pair of wire cutters and cut off the back part of the brad. After the backs of the brads have been removed, set aside in a pile of the same colour. You'll need to count out another thirty four Flower Daisy Dots Brads. 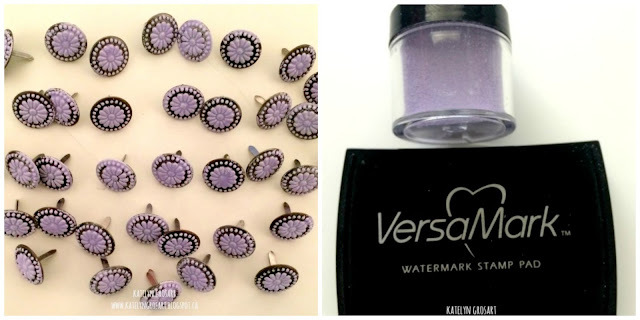 Once you have the brads set aside, dump a little bit of Pastel Lilac Embossing Powder onto a piece of paper towel. One by one, put the top of the brad in the VersaMark and then set into the pastel lilac embossing powder, once the brad is covered, tap off excess and set aside. Continue this step for all thirty four. After all thirty four have been covered in embossing powder, one by one, heat emboss with your heat tool. To keep your fingers from burning, make sure to hold them with tweezers. Once the brads have cooled, take a pair of wire cutters and cut off the back part of the brad. After the backs of the brads have been removed, set aside in a pile of the same colour. For the last set of brads that need to be embossed, you'll need to count out seventeen Flower Daisy Dots Brads. 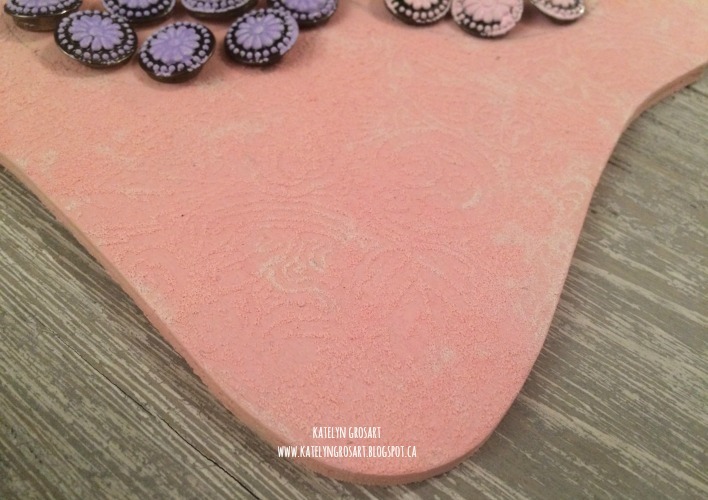 Once you have the brads set aside, dump a little bit of Pastel Mint Embossing Powder onto a piece of paper towel. One by one, put the top of the brad in the VersaMark and then set into the pastel mint embossing powder, once the brad is covered, tap off excess and set aside. Continue this step for all seventeen. 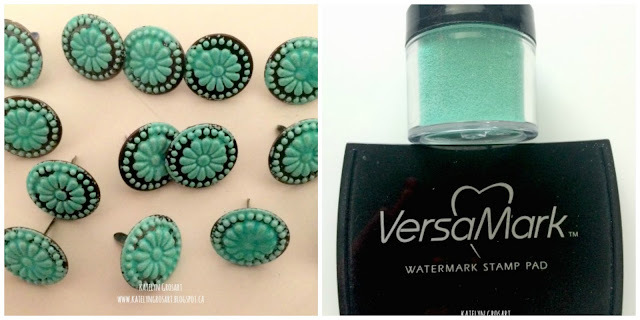 After all seventeen have been covered in embossing powder, one by one, heat emboss them with your heat tool. To keep your fingers from burning, make sure to hold them with tweezers. Once the brads have cooled, take a pair of wire cutters and cut off the back part of the brad. After the backs of the brads have been removed, set aside in a pile of the same colour. Once all of the brads have been covered with embossing powder and the backs have been cut off, it's time to place your brads onto the traced flower on the wood piece. The yellow circle brads are for the centre of the flower and the rest of the coloured brads I alternated for each flower petal. To adhere them to the wood background, I used Pop Up Relief Glue Dots as they are clear and easy to form behind the brad. Here is a close up of what the embossed background looks like on the finished piece. Thanks for stopping by and checking out my flower wall hanging. Don't forget to enter your Anything but Paper project into our Emerald Creek Dares Challenge for your chance to win a $25.00 gift certificate for the Emerald Creek Store! For this little Canadian blogger and designer, today is truly a dream come true for me as I have my very first post on Graphic 45's Blog as a design team member. There are still days that I can't believe that I have made it on to this amazing team as well as be in the presence of such talented design team members. My first Graphic 45 project, is a layout all about me. Let me tell you, this is more difficult than one would think. I'm the last person to make it into photos or even want photos taken of me, so scrapbooking them makes it even harder. For my layout I decided I would use Graphic 45's "Children's Hour". Even though it is a calendar line, combining a variety of the different months and doing some fussy cutting, I was able to capture this layout about myself. 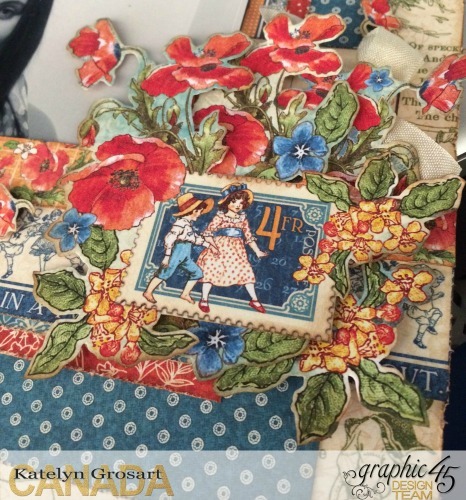 This layout showcases some of my favourite colours, flowers and my love for embellishments. 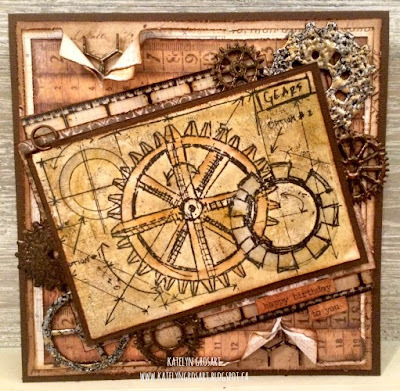 Now that you have a sneak peek of the project, you'll want to head over to the Graphic 45 blog to see the rest of the project and my tutorial on how I created this layout. While you're there, you will also get to see three of my favourite projects that I have created over the years using Graphic 45. You can head here to read and see them. I'm back on the Southern Ridge Trading blog today to share with you some inspiration for our current monthly challenge which is "Anything Masculine". Head over here to read all about how I created this grungy masculine happy birthday card. 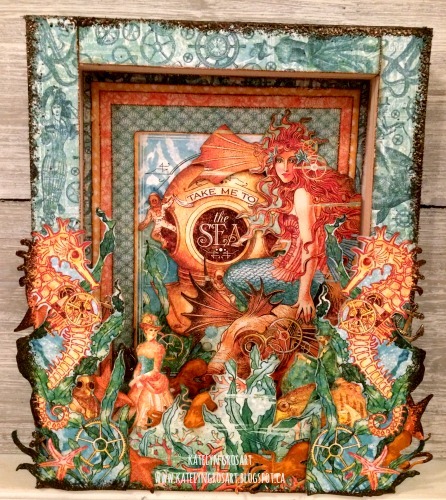 I'm excited to share with you today that I'm on the Creative Scrapbooker Blog today as a guest blogger sharing my Take Me to the Sea reverse Canvas featuring Graphic 45 and Emerald Creek Craft Supplies. 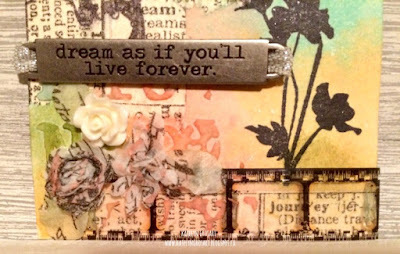 May Remix Tag - "Dream as if You'll live forever"
I'm a couple days late in getting May tag's done, but I made sure that it got done. This year for Tim's 12 tags, it's all about remixing past techniques and combining them together with other techniques that he has shared over the past years. 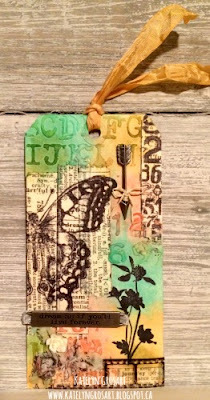 This month's tag features the Tissue Tape Resist and Tattered Florals Techniques. For my tag, I played with a variety of older products from the Tim Holtz Ideaology line to create my tag. It was fun to bring older product out to use as many times the old product gets lost underneath the new product. For the tittle on my tag, I used one of the word bands and added metallic ribbon to it. For the tiny tattered florals, I used my blending tool and applied a layer of Abandoned Coral Distress Ink to them. For the leaves, I used my blending tool and applied a layer of Peeled Paint Distress Ink. I didn't want to use all three tattered florals in the corner, so I added a heirloom rose into the mix. Before adhering the flowers and leaves down, I added a strip of film ribbon to the bottom right hand side. 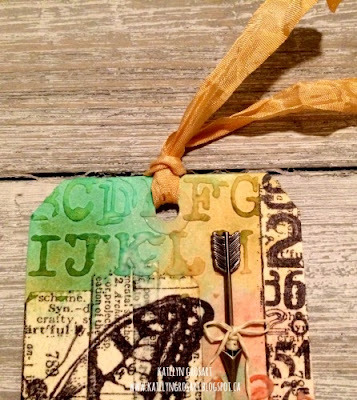 The first finishing touch for the top of my tag was adding an arrow adornment and wrapping some paper string around the bottom of it. The second finishing touch was adding the crinkle ribbon which was dyed using Scattered Straw Distress Stain.